Lekker t-shirt med v-hals i myk blanding av hamp og økologisk bomull. Lekre håndbroderier som gjør den unik. Produsert under gode miljø og arbeidsforhold i Kina av en av Komodos samarbeidspartnere. 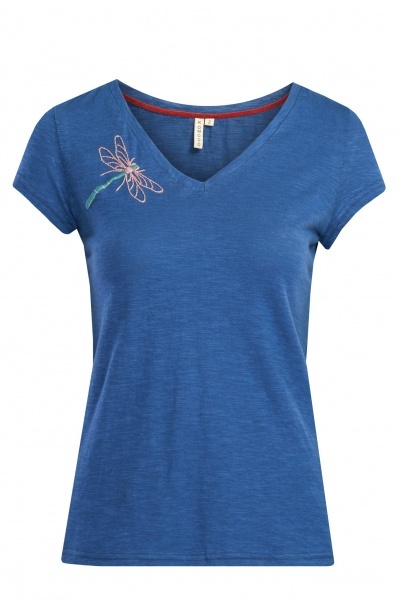 Featuring a short sleeve, a v-neck and a handstitched detail on the neck. An everyday piece t be paired with jeans for a simple and relaxed look or with some feminine jewellery, skirt and sandals for a day off in a lovely cafe? V- neck. Short sleeve. Hand embroidered. Joe Komodo says.. "It's a privilege of our civilization to dressup in comfort and style, but it's also the responsibility of todays fashion designers to make that style fairly and sustainable for those who work on it - otherwise, you can only pretend it's cool !"